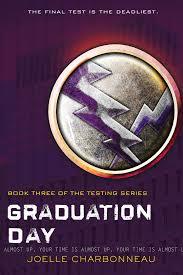 Overview (No Spoilers): The third and final book in The Testing Trilogy, Graduation Day followed Cia’s desperate struggle to assess her constantly changing situation and make the best decisions with the information at hand. I always struggle to remember where the first book ends and the next one begins when I read novels in a series back to back. Hence, I’m struggling to separate the events of Independent Study, which lead to Graduation Day. Overall, compared to the first two components of the trilogy, I found the final segment to be wanting. Cia’s whining and self-doubt/assessment to be boring and rather dull to read through. After reading The Testing and Independent Study, of course I had to finish the series but the ending was filled with predictable twists and wrapped up loose ends much too neatly. What did Zeen say in the Transit Communicator about Symon when Cia had to cut the transmission short? Dr. Barnes really turned out to be a good guy? This goes against all of the information we had been given up till Cia’s final meeting with him. To me, this plot twist seems to be one just to have a twist at the end. Zeen’s character was such a waste. Did he really need to die? He didn’t kill Symon, therefore was his only purpose to have someone Cia really cares about die in the final moments? I loved Will change in character! I knew there was more to him that we were waiting to emerge. I literally rolled my eyes at Gill and Emily being found alive and unharmed in the Decatur Colony. I’m not saying I wanted them injured, it just seemed the Redirected students’ fate was a huge mystery throughout the books and it was neatly wrapped up, picture perfect, within one paragraph.